As the weather begins to warm up, you’ll want to make sure that your home is properly cooled with an efficient and up-to-date home air conditioning system. 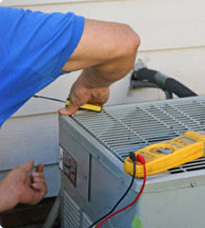 If your air conditioning system is in need of repair, maintenance or installation, give our cooling experts a call. Your family’s health and comfort is our number one priority. We will make sure your air conditioner is operating at peak economic efficiency and check your filters and vents to reduce dust, allergens and pollen making your home safe for your family. And if it’s time for a new one, we also offer air conditioning installation for a number of high quality, energy efficient models.